Airframe, wing and rotor icing is a critical problem in aerodynamics. Ice changes the geometric shape of surfaces it accretes on, which changes its aerodynamic characteristics in unpredictable and possibly catastrophic ways. The Federal Aviation Administration estimates airframe ice can decrease lift by more than 30 percent and increase drag by more than 80 percent. Developing an increased understanding of ice accretion on aircraft is needed to make flying safer. Building a quality mesh that conforms to accreted airfoil ice is quite challenging, especially for glaze ice, which is characterized by a complex three-dimensional roughness with a broad range of scales (down to tens of wall units [i.e., y+= O(102)], and highly concave features. Such features are notoriously difficult to mesh with good wall normal resolution. To illustrate this complexity, Figure 1 shows a photograph and a rendered high resolution CT image of a glaze ice shape on a helicopter rotor obtained in the Adverse Environment Rotor Test Stand (AERTS) facility at Penn State [Reference 1]. 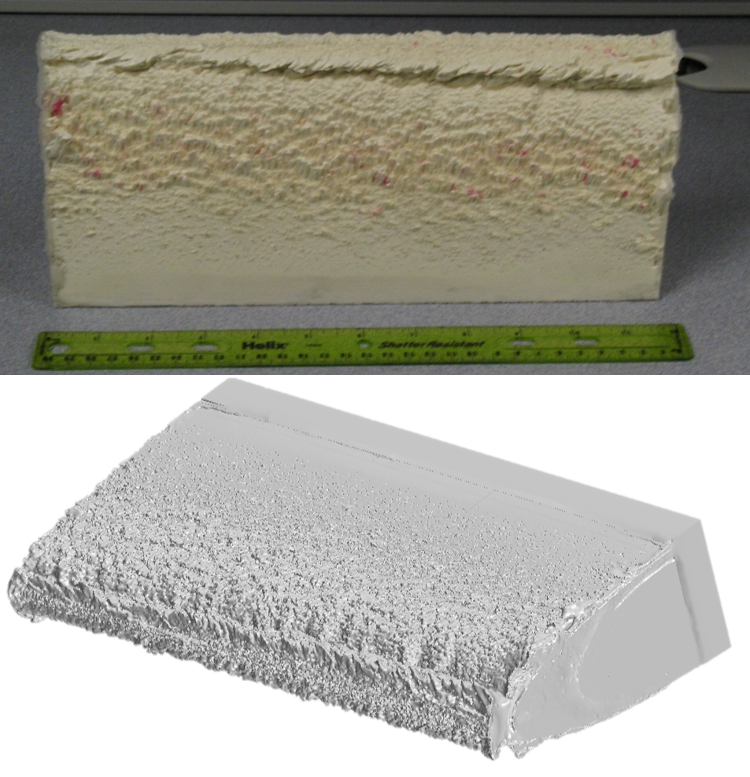 Figure 1: Photograph (top) and rendered high resolution CT image (bottom) of a glaze ice shape obtained in the AERTS facility [Reference 1]. A hybrid prism-tetrahedra mesh is forthcoming (quad-triangle in 2D) for glaze shapes, and our group has successfully applied Pointwise/T-Rex (anisotropic tetrahedral extrusion) in this context, [Reference 2-4]. The robust prism extrusion algorithm in T-Rex enabled us to produce high-quality, sublayer-resolved meshes about the entire airfoil. 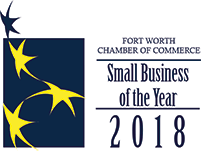 Our experience was that the Pointwise capability of merging prism layers smoothly with outer flow triangles/tetrahedra and adjacent prisms was unmatched by other meshing tools we attempted to use. This capability has been an enabler to this research since we have shown that resolving the transitional and separated boundary layer physics in the “bluff and rough” leading edge region is critical to accurate aerodynamic performance predictions (e.g., stall) [Reference 2,4]. 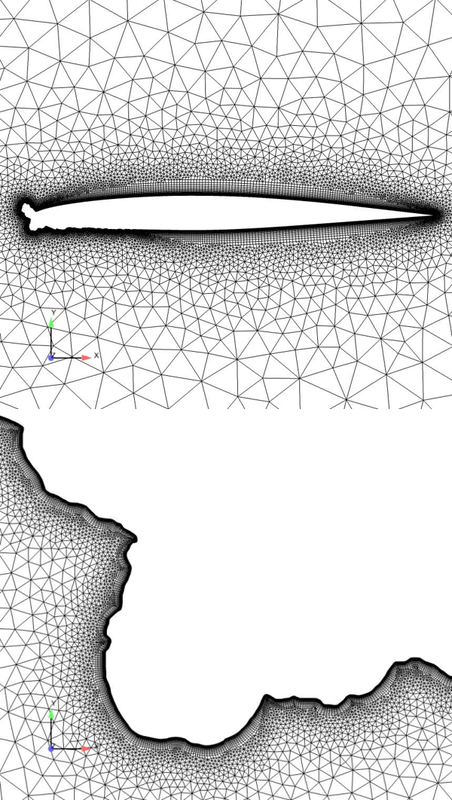 Figure 2 shows two views of a 2-D Pointwise/T-Rex mesh of the GLC 305 airfoil with a glaze ice shape. The leading edge close-up detail in particular illustrates the high-quality (smooth, low-skew, low-stretching) sublayer-resolved mesh obtained. Figure 3 shows elements of two computational fluid dynamics (CFD) studies using this Pointwise/T-Rex gridding approach. As discussed in the references [2-4], these simulations have served to illustrate the sensitivity of solution to turbulence model choice and boundary conditions and the significant unsteady dynamics induced by the glaze ice formation. This conclusion is unapproachable with lesser mesh quality, so we consider Pointwise an enabling technology for this work. Figure 2: Body fitted grid around the GLC 305 airfoil with a glaze ice shape complete airfoil (top) and closeup of lower leading edge (bottom). Figure 3: 2D RANS comparisons of two sublayer-resolved turbulence model predictions for the GLC 305 foil with glaze ice (top) [Reference 2,4]. ILES simulation of an approximate AERTS geometry (bottom) [Reference 3]. Han, Y., Palacios, J.L., “Analytical and Experimental Determination of Airfoil Performance Degradation Due to Ice Accretion,” AIAA 2012-2794. Brown, C. M., Computational Modeling of Rotor Blade Performance Degradation Due to Ice Accretion, Master's thesis, The Pennsylvania State University, 2013. Kim, J., Sankar, L.N., Brown. C.M., Kunz, R.F., Lindau, J.W., Kinzel, M.P., Kreeger, E., “Numerical Simulation of Airfoil Ice Accretion Phenomena,” 2nd Asian/Australian Rotorcraft Forum, 2013. 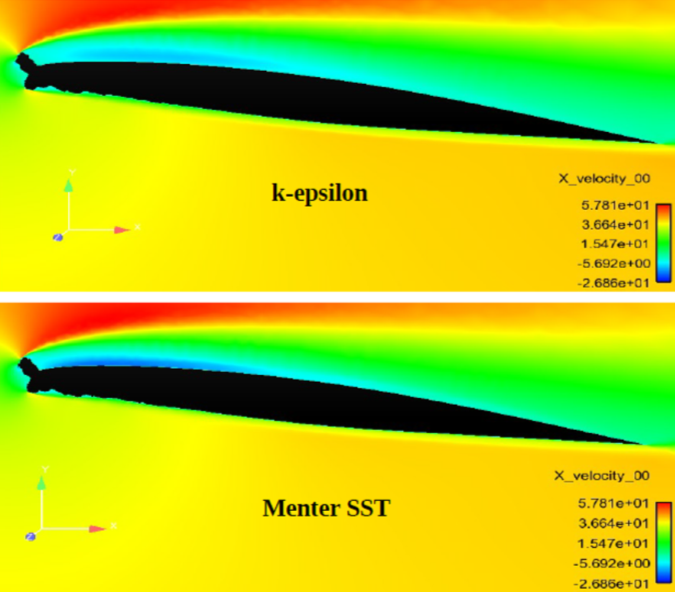 Brown, C.M., Kunz, R.F., Kinzel, M.P., Lindau, J.W., Palacios, J., Brentner, K.S., RANS and LES Simulation of Airfoil Ice Accretion Aerodynamics, AIAA 2014-2203.